The Korean Association of Film Critics Awards has announced the prize winners for its upcoming 38th edition, the ceremony for which will take place in Seoul on December 13. This year’s Grand Prize winner is JANG Joon-hwan’s 1987: When the Day Comes (2017). The hit political drama also earned the Best Music Award. 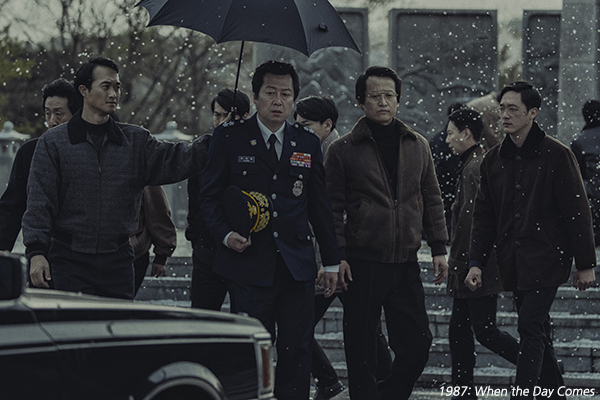 The film with the most awards at this year’s show will be YOON Jong-bin’s espionage drama The Spy Gone North, which has been awarded for Best Director, Best Actor (LEE Sung-min) and Best Supporting Actor (JU Ji-hoon). The Best Actress and Best Supporting Actress Prizes both went to the current indie hit Miss Baek, for lead HAN Ji-min and co-star KWON So-hyun. Also picking up a pair of prizes was LEE Chang-dong’s BURNING, which won for Best Cinematography and will also be presented with the Korean International Film Critics Association Award. The Best Screenplay Award will go to the investigative drama Dark Figure of Crime and the Technical Award will be presented to Along with the Gods: The Two Worlds (2017). In the newcomer prizes, JEON Go-woon won Best New Director for Microhabitat, KIM Ga-hee was awarded Best New Actress for Park Hwa-young and NAM Joo-hyuk was deemed Best New Actor for The Great Battle. The Lifetime Achievement Award will be presented to legendary star YOON Jeong-hee, one of the most prolific and acclaimed actresses of the 1970s, who came out of retirement eight years ago to lead LEE Chang-dong’s Poetry (2010). Meanwhile, a Special Award will also be posthumously awarded to the late HONG Ki-seon, director of The Discloser.